This Bronze Age barrow was partly excavated in 1843 by F.R. Lukis. The earth mound can still be seen but the ditch surrounding it is now infilled. The barrow is part of a cluster of Bronze Age barrows on Harpley Common. Bowl Barrow 1200m east of Crow Hall, Harpley Common. Small tumulus some 36m to 45m (40 to 50 yards) southeast of NHER 3528. Height about 1m (3.5 feet), diameter about 4.27m (14 feet). No ditch, apparently undug. Surface close turf. A.Q. Watson, 12 October 1935. However probably that dug by Lukis in 1843 which contained loose flints at the top and dark stiff sand at the base. See (S1). 15m diameter, 1.05m high with ploughed edges. Grassed. A.J. Lawson (NAU), 7 February 1974. Now 13m diameter, heavily ploughed all round edge. D.A. Edwards (NAU), 18 May 1981. --- Aerial Photograph: TF7527 D; TF7528 B,E,F; TF7627 E,G,M-N,AA-AQ,AT-ABJ; TF7628 A,B,E; TF7727 B,D. --- Archive: Ordnance Survey Staff. 1933-1979?. Ordnance Survey Record Cards. TF 72 NE 13 . --- Unpublished document: Edwards, D.A.. 1989. 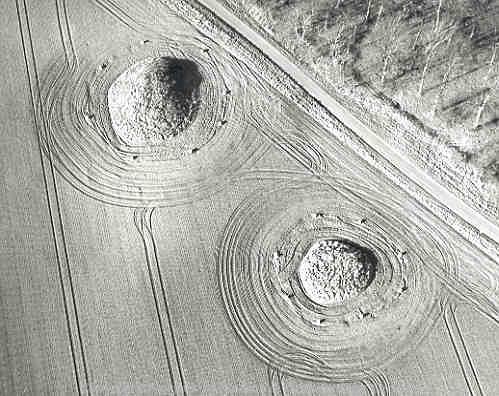 Statement on the Aerial Photography of Plough Damage to Four Prehistoric Burial Mounds (Scheduled Ancient Monuments) at Harpley, Norfolk. 22 February. --- Unpublished document: Edwards, D.. 1989. Harpley Barrow Report.. February. --- Article in serial: Robertson, D. & Paterson, H.. 2010. The Norfolk Monuments Management Project 1990-2010. Twenty Years Conserving the County's Rural Historic Environment.. Norfolk Archaeology. XLVI, pp 15-28. --- Photograph: CXS 2, EME 1, EQF 1-6, EMV 4-5, EQG 1-7. --- Photograph: Edwards, D.A.. 1989. CXT 8 to 9, CXX 6 to 7, EQF 11 to 12, EQG 13 to 14. Harpley Barrows. <S1> Monograph: Edwards, D.. 1976. The Air Photographs Collection of the Norfolk Archaeological Unit.. East Anglian Archaeology. Vol II. <S1> Unpublished document: Lukis, F.C.. Extract from one of the Lukis M.S. Note Books in Guernsey Museum..
<S2> Monograph: Lawson, A. J., Martin, E., Priddy, D. and Taylor, A. 1981. The Barrows of East Anglia. East Anglian Archaeology. No 12.